Virginia's finest country-dining destination with big-city panache. : Falls Church boasts many restaurants, but perhaps none as charming and, indeed, as bucolic as 2941. The contemporary French-American cuisine is both sophisticated and playful, thanks to French chef Bertrand Chemel. In such a setting, would you imagine finding a Vietnamese duck soup and a French onion soup loaded with cheese sharing the lunch menu with assorted takes on burgers? Try the duck burger known as The Daffy. Dinner entrées range from roasted duck breast to a grilled rack of lamb. Breads, which are baked fresh several times a day, are unforgettable and are presented in different shapes and flavors. If you aren’t careful, you’ll end up devouring several basketfuls. For dessert, how about a vanilla buttermilk cake? Expect distinctive wine and bar offerings as well. 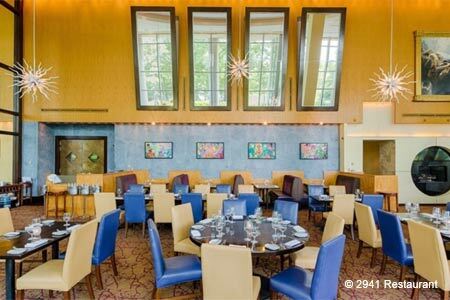 If you are planning on celebrating a special day here, make reservations first.